EPA's closely watched Clean Power Plan rules are key to 'unprecedented' pace of change in U.S. electric power industry. But the rub: Will significant increases in customers' monthly fixed charges impede the transition? With all eyes on Paris, many in the energy industry are eagerly anticipating the extent to which a climate agreement can accelerate the transition to cleaner power. Broad business support for a strong climate deal is helping to propel negotiations. Even Goldman Sachs is bullish on prospects, saying it “expects a wider transition towards greener and cleaner technologies over the next decade . . . and a reduction of more than 5 gigatonnes of CO2 per year” by 2025. Back home in the United States, the EPA Clean Power Plan – which is the core of the U.S. contribution toward an international climate agreement – is advancing despite attempts in Congress to derail it. The majority of governors, including West Virginia’s Earl Ray Tomblin, Colorado’s John Hickenlooper, and Michigan’s Rick Snyder, have pledged to develop state implementation plans to comply with the standard, which aims to reduce carbon pollution 32 percent from electric power plants by 2030. Across the electric power industry, experts declare that the pace of change in the sector is unprecedented, primarily the result of rapidly advancing technologies, like rooftop solar and home battery storage units. That bodes well for power sector compliance with the Clean Power Plan. But here’s the rub: rate designs at the state level are not keeping up with these technological advances designed to lower power sector carbon emissions. As customers increasingly add solar to their roofs and find new ways to save energy, we need to ensure that electric utilities can earn the revenues they need to invest in maintaining and modernizing the electric grid. Debates on this issue are playing out all over the country, in states such as Wisconsin, Connecticut, Arizona, Maryland, Hawaii, Nevada and Washington, where utilities have been proposing significant increases in the fixed charge portion of a customer’s electric bill to cover grid maintenance costs as their revenues decline. Needless to say, consumer and clean energy advocates are strongly opposed to such increases in charges, which can dampen enthusiasm for clean energy and negatively affect low-income customers. To achieve the goals of the Clean Power Plan and meet our international carbon-cutting obligations, we need to figure out how to get past this logjam. Ceres’ “Pathway to a 21st Century Electric Utility” (“Pathway”) lays out a vision for getting beyond these conflicts with win-win solutions that work for all stakeholders – electric utilities, solar energy and other third party providers, consumers, and regulators. It’s authored by financial expert Peter Kind, the lead author of Edison Electric Institute’s 2013 “Disruptive Challenges” report. His paper attracted widespread attention because it described, in compelling fashion, the challenges the electric utility industry faces in light of increasing competition from distributed energy resources, such as energy efficiency, rooftop solar, and battery storage. Pathway is a significant shift for Kind because his prior report encouraged utilities to increase fixed charges as a potential solution to utility revenue challenges – even as it also recommended that utilities “identify new business models and services.” Pathway notably takes a more holistic approach and recognizes the critical role that utilities play in maintaining and enhancing the grid, the need for adequate revenue streams to enable investment, and, of course, the imperative to cost-effectively increase investment in clean energy, and especially energy efficiency. The report lays out forward-looking approaches to state policy, regulatory reform, rate structures, and utility accountability that do not involve significant hikes in fixed charges. Pathway highlights the flaws associated with fixed charges and instead suggests alternatives like time-of-use rates, revenue-decoupling, bi-directional meters, accountability incentives, and eventually performance-based regulation that encourages utilities to achieve collective goals. 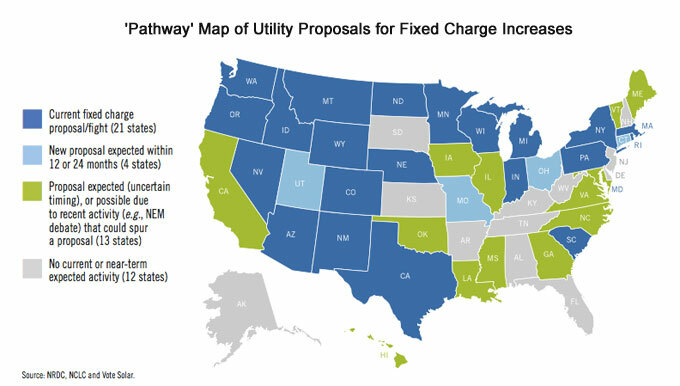 The report comes as many electric utilities have been proposing significant increases in fixed monthly charges (see map below), but with strong backlash from consumer and clean energy advocates. At last month’s meeting of the National Association of Regulatory Utility Commissioners (NARUC), numerous experts and advocates recommended against significant fixed charges, and it appears that the tide is shifting away from this approach. Indeed, many state commissions have either rejected or significantly limited the increases in fixed charges due to strong opposition from consumer and clean energy advocates. As electric utilities begin to acknowledge that increasing fixed fees is not the solution to the challenges they face, they may well turn to more constructive and long-term approaches. As states begin developing initial compliance plans for the EPA’s Clean Power Plan (CPP), which are due in late 2016, Pathway urges utilities, policymakers, and key stakeholders to work together to align their compliance approaches with new rate designs that help evolve electric utility business models. Negotiators in Paris can take heart that the U.S. will follow through on its carbon-cutting commitments via the Clean Power Plan, despite the bluster of certain naysayers. Discussions among industry stakeholders at the recent NARUC could best be characterized as having an air of “inevitability and achievability,” with most states and utilities now primarily focused on developing the most cost-effective approaches. Most tellingly, the chief executive officer of American Electric Power (AEP), Nick Akins, who declared a year ago that the proposed CPP was “completely unworkable,” now describes the final rule as a “catalyst for transformation” that will support customers and reduce the company’s environmental footprint. AEP, one of the largest and most reluctant U.S. power companies to embrace the clean energy future, not only supports the CPP now but is even pulling its membership from ALEC, the American Legislative Exchange Council, in part over its climate change stance. That’s progress. And now we just have to re-think rate design to align with the transformation. Dan Bakal is director of Electric Power Programs at Ceres, a nonprofit sustainability advocacy organization that mobilizes business leadership on climate change and other sustainability challenges.